The leading European missile systems designer and producer MBDA and unmanned vehicles manufacturer Milrem Robotics will begin developing the world’s first Unmanned Ground Vehicle (UGV) specially designed for anti-tank purposes. The joint project will feature the IMPACT (Integrated MMP Precision Attack Combat Turret) system from MBDA that will be integrated onto the THeMIS Unmanned Ground Vehicle by Milrem Robotics. The THeMIS UGV is a fully modular diesel-electric unmanned ground vehicle that can operate up to 10h with a full tank, including up to 1,5h in silent mode. It has a top speed of 22 km/h and can carry a payload of 750 kg. It can be operated line of sight, via cameras or equipped with an autonomy kit for fully autonomous operation. The new system will be remotely operated and is in line with the system developers’ main aim of exchanging humans on the battlefield for much more capable robots. “One of the challenges in urban warfare is keeping anti-tank infantry hidden from the enemy’s surveillance equipment that can very easily detect soldier’s heat signature. The aim of our joint integration project is developing a system that has a low heat signature and most importantly - will keep infantry in a safe distance,” explained Brigadier General (res) Alar Laneman, Military Advisor of Milrem Robotics. “MMP, the world’s only 5th Generation anti-tank guided weapon, now in service within the French Armed Forces, has been developed for both mounted and dismounted applications and is suitable for unmanned ground vehicle (UGV). With its 4km+ range and its two firing modes - lock on before launch (LOBL) and lock on after launch (LOAL) - the MMP gives to THeMIS UGV an unmatched capability to engage a target beyond line of sight,” said former Colonel Francis Bordachar, Military Advisor of MBDA. “MMP allows, within remote operation, to engage very discreetly battlefield targets at ranges greater than the enemies counter fire, from behind cover and within structures in fighting in built-up areas. The MMP Firing installation deployed on UGV also provides an ISTAR (Intelligence, Surveillance, Target Acquisition, & Reconnaissance) capability and, through direct integration with a C4I network, delivers battlefield intelligence out beyond the platoon,” Bordachar added. 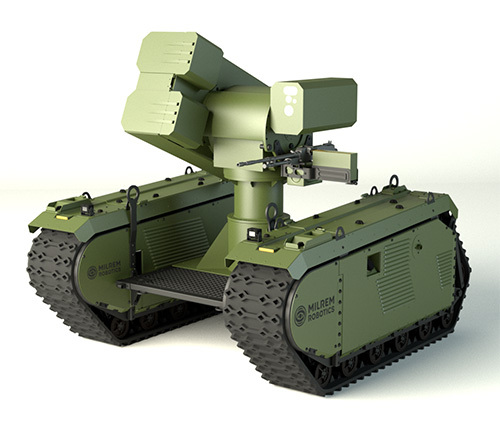 Milrem Robotics is an Estonian defense solutions provide whose primary focus is the manufacture of unmanned ground vehicles, development of robotic warfare solutions and performing concept of operations and doctrine level warfare analysis. With a significant presence in five European countries and within the USA, in 2017 MBDA achieved a turnover of 3.1 billion Euros with an order book of 16.8 billion Euros. With more than 90 armed forces customers in the world, MBDA is a world leader in missiles and missile systems. In total, the group offers a range of 45 missile systems and countermeasures products already in operational service and more than 15 others currently in development. MBDA is jointly owned by Airbus (37.5%), BAE Systems (37.5%), and Leonardo (25%).